Purine is a heterocyclic, aromatic, organic compound, consisting of a pyrimidine ring fused to an imidazole ring. Heterocyclic compounds are organic compounds (containing carbon) that contain a ring structure containing atoms in addition to carbon, such as sulfur, oxygen, or nitrogen, as part of the ring. Aromaticity is a chemical property in which a conjugated ring of unsaturated bonds, lone pairs, or empty orbitals exhibit a stabilization stronger than would be expected by the stabilization of conjugation alone. 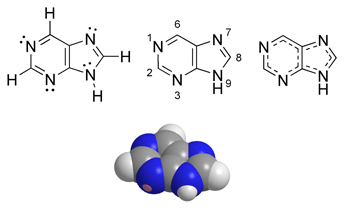 Imidazole refers to the parent compound C3H4N2, while imidazoles are a class of heterocycles with similar ring structure but varying substituents. More broadly, the general term purines also is used in reference to derived, substituted purines and their structurally related tautomers (organic compounds that are interconvertible by a chemical reaction). 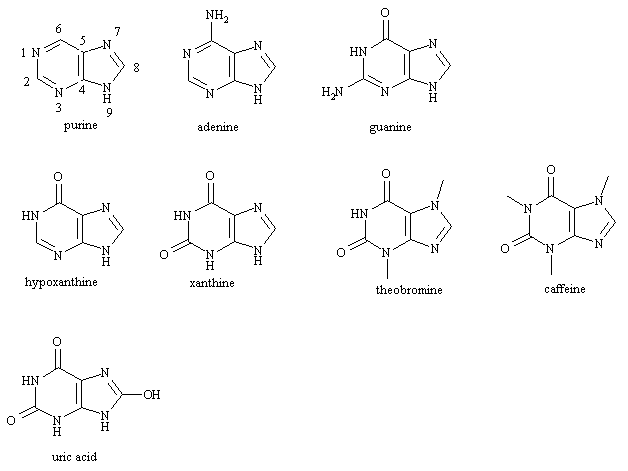 Prominent purines (derivatives) include caffeine, and two of the bases in nucleic acids, adenine and guanine. In DNA, adenine and guanine form hydrogen bonds with their complementary pyrimidines, thymine and cytosine. In RNA, the complement of adenine is uracil instead of thymine. Purine is also a component in Adenosine triphosphate (ATP), which stores and transports chemical energy within cells. While purines are essential for humans, overconsumption of foods rich in purines can be a problem. A study over 12 years by Choi et al. (2004) led to their concluding that a high intake of meat and seafood, which are rich in purines, correlates with an increased risk of gout. Purine was named by the German chemist Emil Fischer in 1884. He synthesized it in 1898. Fischer showed that the purines were part of a single chemical family. These hydrogen bonding modes are for classical Watson-Crick base pairing. Other hydrogen bonding modes are seen in both DNA and RNA. Of significance, the additional 2'-hydroxyl group of the ribose moiety in RNA expands the configurations through which RNA can form hydrogen bonds. In addition to being biochemically significant as components of DNA and RNA, purines are also found in a number of other important biomolecules, such as ATP, GTP, cyclic AMP, NADH, and coenzyme A. Other notable purines (derivaties) include xanthine, hypoxanthine, theobromine, caffeine, and uric acid. Purines are found in high concentration in meat and meat products, especially internal organs such as liver and kidney. A plant-based diet is generally low in purines , although there are significant amounts in dry beans, spinach, and mushrooms. Purines are biologically synthesized as nucleosides (bases attached to ribose). Both adenine and guanine are derived from the nucleoside inosine monophosphate. Inosine monophosphate is synthesized on a pre-existing ribose through a complex pathway using atoms from the amino acids glycine, glutamine, and aspartic acid, as well as formate ions transferred from the coenzyme tetrahydrofolate. Purines from food (or from tissue turnover) are metabolized by several enzymes, including xanthine oxidase, into uric acid. High levels of uric acid can predispose to the gout when the acid crystalises in joints. This phenomenon only happens in humans and some animal species (e.g. dogs) that lack an intrinsic uricase enzyme that can further degrade uric acid. The deficiency of another enzyme, adenosine deaminase, needed to break down adenine, is a cause of severe combined immunodeficiency. Choi et al. (2004) conducted a study whereby they concluded that higher levels of meat and seafood consumption correlates with an increased risk of gout, whereas a higher level of dairy product consumption is associated with a decreased risk. Moderate intake of purine-rich vegetables and protein was not associated with an increased risk of gout. Purines from turnover of nucleic acids (or from food) can also be salvaged and reused in new nucleotides. The enzyme adenine phosphoribosyltransferase salvages adenine, while hypoxanthine-guanine phosphoribosyltransferase (HPRT) salvages guanine and hypoxanthine. Genetic deficiency of HPRT causes Lesch-Nyhan syndrome. Choi, H. K., K. Atkinson, E. W. Karlson, W. Willett, and G. Curhan. “Purine-rich foods, dairy and protein intake, and the risk of gout in men.” New England Journal of Medicine 350: 1093-1103, 2004. Moreland, L. W. “Febuxostat: Treatment for Hyperuricemia and Gout?” New England Journal of Medicine 353: 2505-2507, 2005. Underwood, M. “Diagnosis and Management of Gout.” British Medical Journal 332: 1315-1319, 2006. This page was last modified on 16 June 2015, at 19:41.